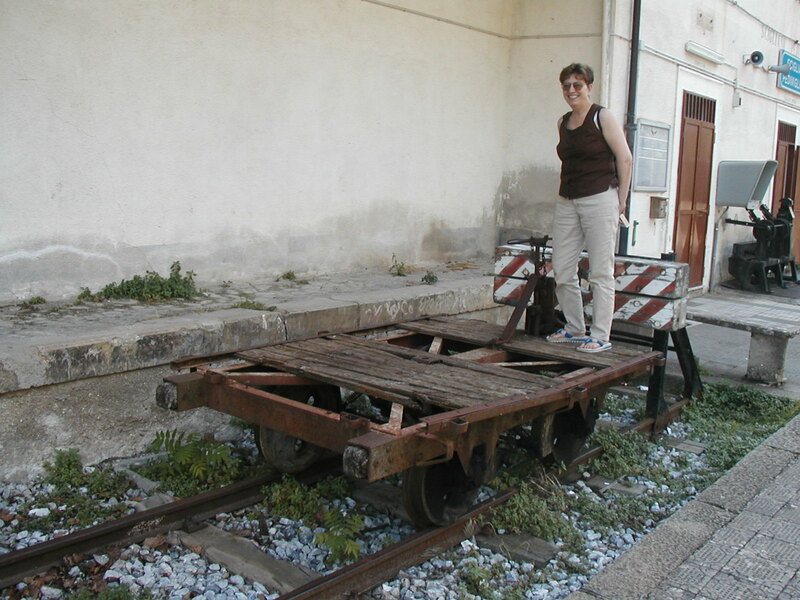 My sister Marlie boards the regional train to Scigliano–JUST KIDDING! We saw this ‘retired’ rail car in the station at Cosenza. Vern and I watched Italy stream by through the train windows on our way from Rome to Sorrento. We were excited to begin our Italian language classes, and just plain delighted to be in Italy. Sure, it was February and cold and damp, but I’d lived most of my life in Alaska, where June is liable to be colder than February in Italy. In Naples, we needed to change trains. At Garibaldi station, we were directed to a long corridor, more like a tunnel, which led to a platform for the Circumvesuviana railway, much smaller than the main station. Having rarely traveled by train, the large timetable posted on the wall mystified us. I asked for help from a woman nearby, another traveler, but wasn’t sure she understood me. She waved in the direction of a train, and we boarded it. The schedule for another regional train system. We rode to Piedimonte for a Saturday evening event , and discovered that the train did not operate on Sundays. We had an extra day at the end of the line. With standing room only, I sat on a suitcase as the train chugged out of Naples. We were the only passengers with luggage–somewhat surprising since Sorrento is such a tourist destination. The little train stopped at a couple of stations, and a man nearby overheard us talking about Sorrento. He didn’t speak English, but assaulted us with a barrage of Italian dialect of which I understood nothing. Nothing of the words, anyway. But he was clearly urging us to go back and take a different train. We declined. Our conversation was attracting the attention of several other passengers, but none offered any help. This seemed to be a commuter train, and a few people got off at each station. Eventually, after failing to persuade us, the man who wanted us to go back also left the train, shaking his head in frustration. It was clear to us by this time that the train had left to coast and headed inland. The cone of Mt. Vesuvius rose up on our right, and small farms and vineyards fell away to the left. This was not the route to Sorrento. We asked a couple of other people if they spoke English–no one did, except for a few words. But one man took pity on us, and struggled along with my poor Italian. Yes, we were on the wrong train. Ma, non ti preoccupare. Don’t worry. We could get off at his stop, and another train from there went back to the coast, where we could resume our journey to Sorrento. What about our tickets? Don’t worry. 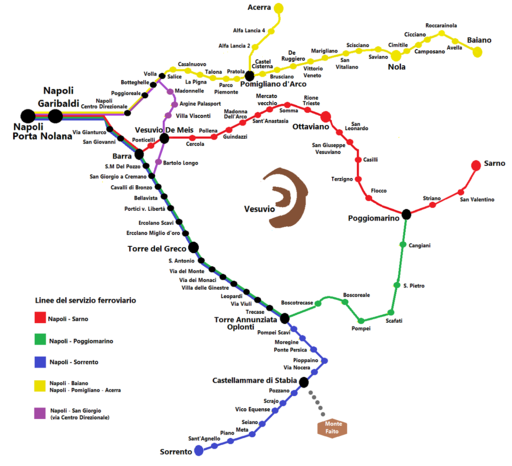 Map of the Circumvesuviana rail lines showing our circle tour of Mt. Vesuvius on the way to Sorrento. This is the same train line that goes to Pompeii. And he was right. Nobody asked about our tickets. We were soon on the train to the coast, and then on to Sorrento–an hour or two later than we expected, but laughing at our mis-adventure already. That was our first experience with the regional railways of Italy. 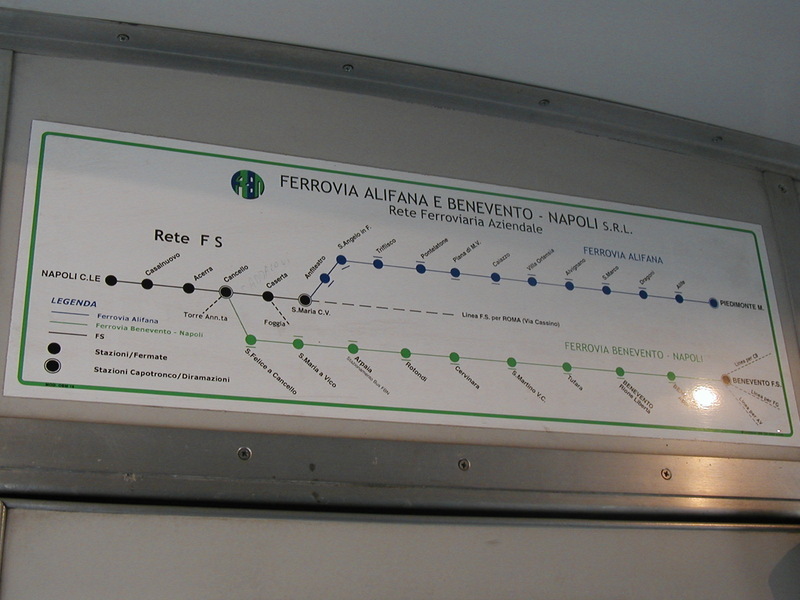 The Circumvesuviana line operates in an area that attracts many tourists, and has an English language option on its website. This is not true of all the regional railways. A few months later, we traveled from Cosenza to Scigliano on the Ferrovie della Calabria (Their website has some great photos of their vintage passenger cars.) for a delightful hour surrounded by high school students on their way home from school and fascinated to see American tourists on their train. By this time my Italian was much improved, but most of them wanted to practice English phrases on us. What can you expect on the regional trains? Far fewer English speaking employees, so be prepared. Generally inexpensive fares–but then the trips are shorter too. The train cars are quaint, rustic, still in service after many years. No sleek, high speed modern trains, no dining car. But a great place for cross-cultural adventure, so don’t be afraid to try one! This entry was posted in Travel, Uncategorized and tagged Circumvesuviana, Ferrovie della Calabria, Italy, rail travel, regional trains, travel. Bookmark the permalink. What a surprise to see me on your post! I love riding the trains in Italy, and all over Europe! It’s a great way to get around and see a little more of the country as you go. WJ and I were going from Italy to France, and the car we were on got dropped from the train at a station… the cleaning people let us know that we had to get off and go find another train! So you had quite an adventure too! For those unfamiliar with it, riding trains isn’t as straightforward as it seems, but I like it too.